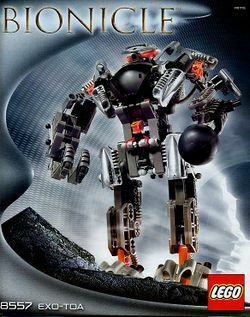 8557 Exo-Toa is a BIONICLE set released in 2002 as a Titan set. It includes a missile cannon. It contains 360 pieces. Exo-Toa are armoured suits that could be worn by the 2001 Toa Mata and the 2002 Toa Nuva. The Toa tried to use the suits to defeat the Bahrag, but took them off after they realized using them reduced their power. The Exo-Toa (unpiloted) later made an effort to defeat the Bohrok-Kal, but failed and were destroyed. This is a description taken from LEGO.com. Please do not modify it. (see an archive of the product's page) Ultimate power for your Toa! When a Toa dons the Exo-Toa armor, he wields more power than any being on Mata Nui has ever known! Hidden underground for centuries, the Exo-Toa features a mighty claw arm and an electro-missile that really fires. But will even the power of the Exo-Toa be enough to overcome the Bahrag? Ultimate power for your Toa! When a Toa dons the Exo-Toa armor, he wields more power than any being on Mata Nui has ever known! Hidden underground for centuries, the Exo-Toa features a mighty claw arm and an electro-missile that really fires. But will even the power of the Exo-Toa be enough to overcome the Bahrag?